The weather here is turning a bit chilly. It was cool and rainy this morning when I got up, so I decided to put a pot roast in the crock pot for dinner this evening. I saw the recipe on Facebook and it only called for a few ingredients. That's my kind of recipe! Brown the roast in a skillet with salt and pepper until a crust develops. It creates a yummy taste when it's browned first. Mix the 2 cups of liquid with all three envelopes of dry seasoning packets. Place the browned meat in the crock pot and then pour liquid over it. Cover and cook on high for 6 hours. Cut and enjoy! I will definitely make this recipe again. It was so flavorful and well seasoned. It stayed moist and fell apart when I sliced it. Yum! I served it with mashed potatoes and salad. It was a rib sticking meal that pleased my family. John will also enjoy this meat on a roll for a quick dinner when we are busy and unable to cook a proper meal this coming week. I think I will double the meat next time because 3 pounds is not enough even for our small family. I also like to take our leftovers to work for lunch, so I will buy six pounds of chuck roast next time. I probably won't have to double the liquid because there was plenty. My crock pot is 25 years old, but is quite large and can handle as much meat as I want to cook. Sadly the devastation of Hurricane Harvey has impacted areas from Galveston to Houston. Dallas is 250 to 300 miles north of the Houston area, so our weather was not impacted by the storm. We got some rain last weekend, but that has been typical this summer. The rainfall in our area is up, but we are not in danger of flooding, thankfully. Donations to benefit storm victims can be made through reputable organizations such as Red Cross and Walmart. We received a donation bag in the mail to give used household items for the cause and our school district is collecting items as well. The Dallas area is a safe haven for some of the Houstonians fleeing the devastation. We will see more people moving into the area soon because Houston is mandatorily evacuating the flood areas and cutting electrical power, making it impossible for homeowners to stay. Keep Harvey victims in your prayers. 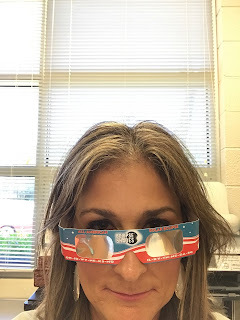 Did you see the eclipse? 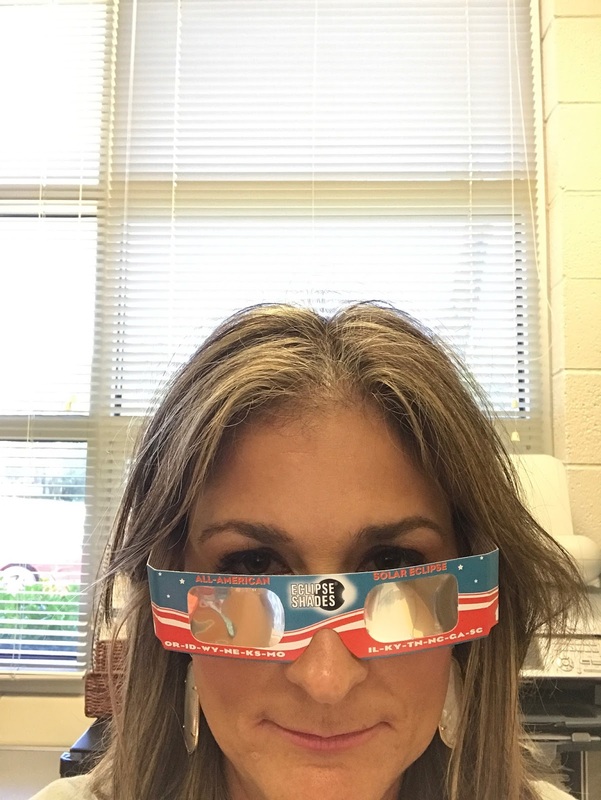 I am blaming all of the crazy weather (and a lot of other weird things) on the eclipse. I wonder if it is a real phenomenon to have a hurricane, or significant weather event, after a lunar eclipse. The internet says there should be no noticeable weather impact on earth, but areas that have the total eclipse may notice a slight weather impact. 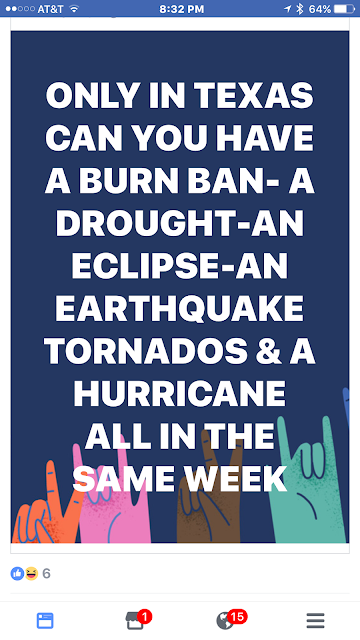 No examples were sited, but it seems a little more than coincidental that a category 4 hurricane hits the coast immediately following an eclipse. Like father, like daughter. Isn't my dad adorable!!! I saw this funny quote from Facebook the other day, and it really resonated with me. Now you can add the "threat" of a gas shortage to the list too! It's been impossible to find gas stations with gas, so I have resorted to using the app called "Gas Buddy." It shows gas stations in your zip code that are stocked. You just need to pray that they don't run out before you get there. It took us 45 minutes to actually get to the pump after finding a station with gas. The media and transportation commissioner assure us that there is not a gas shortage. There has been a slight panic of a shortage, so everyone is demanding gas at the same time, causing gas to run dry. It's been crazy around here!!! My car, a 2012 Buick Enclave, has been having mechanical problems for a while. Motor mount problems have plagued the car causing a clunking noise in the front end. The problem is that two motor mounts, which appear to be the screws holding the motor in place, failed and were replaced. Then I noticed the clunking again and, low and behold, the other mounts gave way!! Then the air conditioning stopped working. It was blowing hot air. Here in Texas, that is a really bad thing. It was quickly fixed, but within a couple of months, it was blowing hot air again. Well, it turns out to be another problem with the air handler. Big Tex decided to buy the expensive extended warranty, to the tune of $2,500, to cover the cost of repairs for the next five years. When I picked up the car from the service department this week, the clerk cheerfully said that the cost of the repair was $1,100, but my cost was only the $100 deductible. I am usually courteous to people, but I embarrassed my daughter and made a comment about the quality of the Buick product. Maybe we expect a lot from our cars, but I feel like a four year old car should be in good working condition. The air conditioning in the house failed downstairs recently, the refrigerator in the garage, and the clothes dryer all broke this week as well. I was driving John's car over the weekend and the vent was blowing hot air. I texted him to let him know something was going on. I told him I would try not to break anything else until he got home. We decided not to replace the garage refrigerator right now. The unfortunate thing about that failure was that we lost a bunch of food I had just bought at Cosco. Sadly, the milk and all of the overflow items I store out there were lost. I also need to be conscious not to overbuy at the store now because we have limited space in the inside fridge. 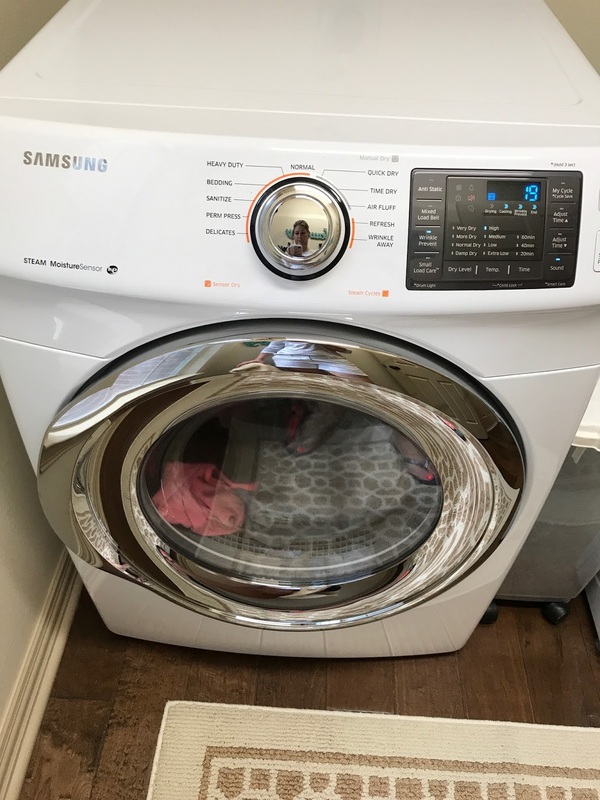 I bought a Samsung dryer to replace the broken one. I have never owned a Samsung appliance and have read awesome reviews online about the model I bought. I really wanted a matching LG dryer to the washer we have, but the reviews weren't great for that model. The worst was the claim that the machine had something inside that would tear clothes. This happened in another machine we had, so I steered clear of that whole mess. Happy Labor Day!! Stay tuned for my second installment of the home tour and a post about what I did over the long weekend while the rest of the family was in Chicago.